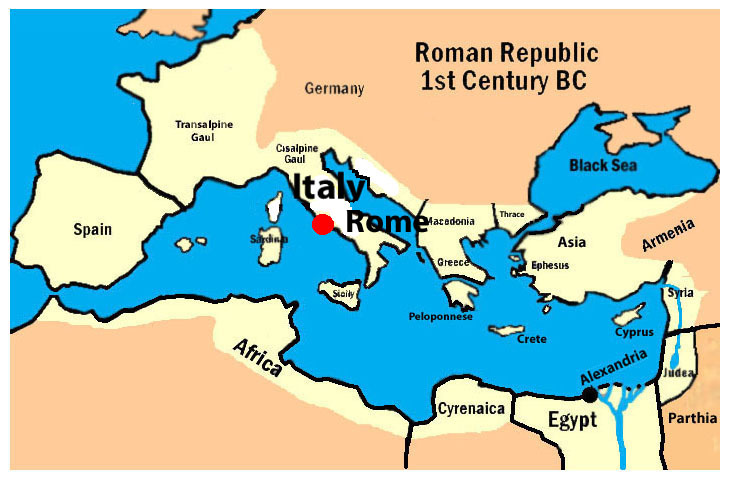 The legend is that Rome was founded in 753 BC on the Palatine Hill by the twin brothers, Romulus and Remus. In a battle for power Romulus slew Remus and became Rome’s first king. The ‘Age of Kings’ lasted until 509 BC when the ‘Ancient Brutus’ drove King Tarquin from Rome and established the Roman Republic. As Rome spread its rule throughout Italy, they battled invading tribes from Gaul (modern France), defeated Hannibal in the Battle of Zama in 202 BC, thus ending the Second Punic War with the Carthaginians, and put down slave uprisings, most notable the one led by Spartacus in 71 BC. In 52 BC, Julius Caesar conquered Gaul, then became engaged in a civil war when his enemies in the Roman Senate challenged him. He won, defeating Pompey the Great in the battle at Pharsalus in Greece in 48 BC. After this war, he forgave many of the Roman senators and nobleman who fought against him on the side of Pompey. However, they still considered him an enemy. When Caesar returned to Rome, many in the Senate were plotting against him and devising plots to assassinate him. In 44 BC, Caesar is assassinated in Rome. In his will he adopts his eighteen-year-old great nephew, Octavian, as his son. Armed only with Caesar’s name and his own personal charisma he goes on a path of vengeance that doesn’t end until he takes Caesar’s place. In 27 BC, Octavian takes the the name Caesar Augustus when he becomes Rome’s first Emperor, thus marking the end of the Roman Republic and the beginning of the Roman Empire.